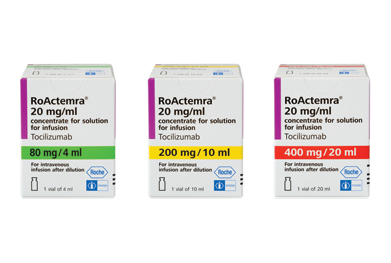 The IL-6-inhibiting antibody tocilizumab (RoActemra) can now be used to treat active systemic juvenile idiopathic arthritis (sJIA) in children 2 years of age and above when the response to NSAIDs and systemic corticosteroids is inadequate. It can be given in combination with methotrexate or as monotherapy when methotrexate is inappropriate or not tolerated. In the randomised, double-blind TENDER study (n=112), significantly more children treated with tocilizumab achieved the primary endpoint (≥30% reduction in JIA ACR core set score and absence of fever) at week 12 compared with children who received placebo: 85% (64/75) versus 24% (9/37), respectively (p<0.0001).